At long last, I finally was able to make time to get to the #1 pizza place recommended by the readers of the NEPA Pizza Review. After about 4 months, and approximately 25 recommendations for Pizza Perfect, I teamed up with a buddy who was equally familiar with the "How's your pizza? How's your Bar-B-Que? - JUST PERFECT!" commercial which consistently runs on local stations here in NEPA. Although I had no interest in being in Pizza Perfect's next commercial, I did have a great interest in finally trying this mythical pizza. Upon driving in, I was a little surprised at the structure of the building, as it resembled an old bowling alley with the curved roof and older exterior. I've learned that the quality of the pizza and the aesthetics of the building rarely have any sort of correlation. As long as the dining room and kitchen were clean, which seemed to be the case here, it's just fine with me. Anyway, we took our seats in the dining room, which really gave me a vibe that Guy Fieri will visit at some point in the future for his food network show. The menu notes that pizza is sold by the slice, and you can order as few or as many as you like, which is a new concept for me. 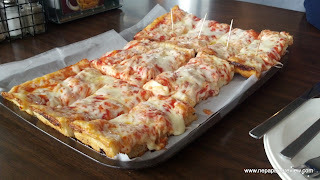 Usually you order a half or full tray of old forge pizza, but when you head a little further south of Old Forge, they offer this "deep fried Sicilian" pizza by the slice. When the slices came out, they were piping hot, with a generous amount of cheese on top, a bright red and vibrant sauce, and a thick crust. I ordered my slices with onions because this is the default way that it is served. The onions are sliced, chopped, then sprinkled on the sauce, so they are very easy to detect. I thought the onion flavor was a nice addition to the simple, yet fresh and tasty sauce. The onion really provided one of the prevalent flavors in the mix, but didn't overpower the whole pizza. The crust was really the centerpiece, as it is so thick, dense, and slathered with oil. 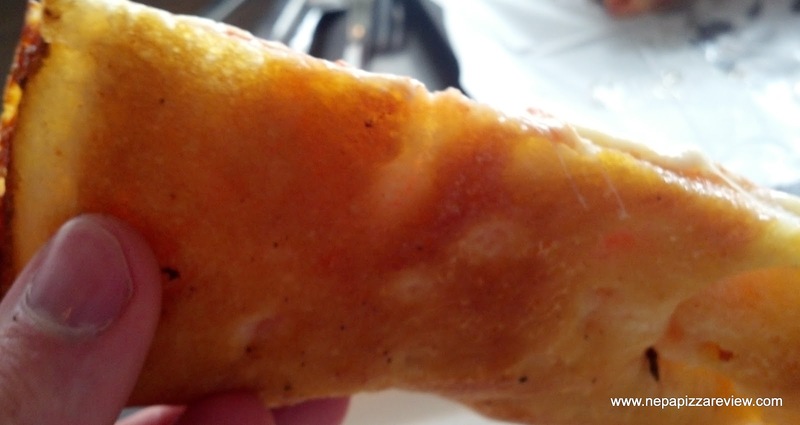 The oil provides the deep fried effect on the bottom and adds to the density of the crust. Although the oil flavor was a bit more prevalent than I would have liked, it didn't really take away from the experience all that much. If the pizza was cooked a little further, the crust would have been crispier, and probably would have improved that oily flavor a bit. My co-reviewer made a good comparison on the cheese, which is a standard mozzarella. The texture and consistency is really like that of a Pizza Hut or Domino's cheese, which typically isn't a compliment to a pie, but in this case it really worked. I must say I expected to be wowed by this pizza based on the overwhelming response from readers and the excellent reputation that precedes Pizza Perfect in the area. Overall, I did find the pizza to be good, but it didn't wow me so I think this pizza's legendary status worked against itself a bit in this review. In any event, I would recommend that you get to Pizza Perfect and give it a try. Please see what my friend and fellow pizza critic, Pizza Quixote has to say about Pizza Perfect and Pan Fried Sicilian! My top picks (in order) for fried sicilian in NEPA are Tommy's Pizza in Kingston, Victory Pig, Pizza Perfect and Norm's Pizza in WB. Pizza Perfect is good, although sometimes I get it and it has very little sauce on it. I know there isn't supposed to be a lot, but sometimes there's hardly any. Not a fan of Pizza Perfect's wings, they're a bit anemic and the sauce isn't very good, so if I'm in the mood for good fried pizza and wings it's definitely Tommy's over PP. Great insight and suggestions. I still have to get to Tommy's and Norm's, so I added your suggestions to my list on the website. Thanks!